Please, make sure your MacbookPro supports 8GB DDR3 1600MHz speed ram into one slot. Finding compatibility: On your Mac screen find and click Apple icon located in left hand side upper corner and chose " About this Mac ". Click " More info ". In the Contents section on the left side of the screen, click " Memory " See memory type and memory speed- MAKE SURE, YOURS IS DDR3, 1600MHz. Your Mac must support 8GB ram into one slot. Hey yall! I'm really pleased with the installation of ram on the Mac Mini, it's so easy! I didn't even need to have to use a screw driver. At first, I thought I would gain a big performance boost from currently having 4gb and upgrading to 16gb. However, I don't even seem to notice any difference. Star time for Mac OSX takes around the same ammoutn of time but I don't think RAM does't help start up, only fast HD does. The one good thing though that I noticed was that my Mac Mini seems to be running a lot cooler! When I only had 4gb, my machine would heat up a ton. Much faster Mac Mini Review by Gottfried F. Metzler "Ole Photographer"
My Mac Mini is much faster with 16 GB of RAM. 1. Creating a DVD burn disc for a 1.5 hour DVD. Used to be 3-4 Hours; now 48 Minutes. This product has bee great. It has allowed me to run so memory intensive programs, without any problems. Great price, fast shipping and it works! Review by Kurt H.
I ordered these because the price was good. This has been running in my laptop for over a month and I have not had any problems. It has made my laptop work much better. 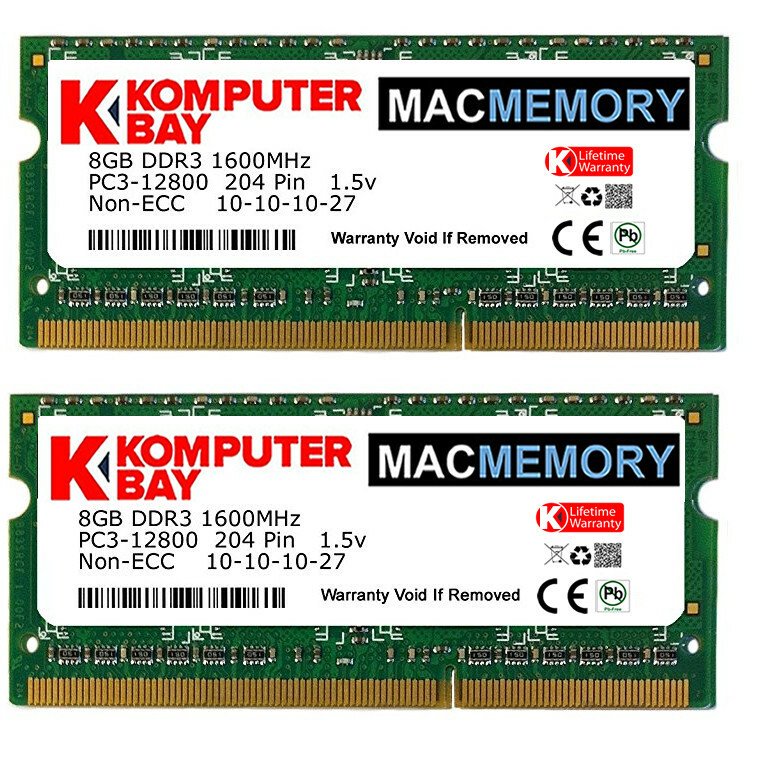 I bought this 16GB RAM initially for my mid-2012 macbook pro. I ran the macbook full hardware test immediately after I have RAM installed and the result is positive. I thought I made a good decision until I found my macbook reboots every now and then. I then rerun the full test for a few times then found RAM fails 2 out of 3 tests. Not 100% Compatible with 2011 Mac Mini Review by Joseph M. Baltrus, Ph.D. "Balthazar"
One of these modules failed almost immediately, but failed in a way that caused me to lose everything. And, of course, Komputerbay takes no responsibility. Telling people "it works when it leaves the factory" is a crappy way to do business. Saved BIG bucks over Apple brand product of same specs. i\Immediate improvement in speed and performance! 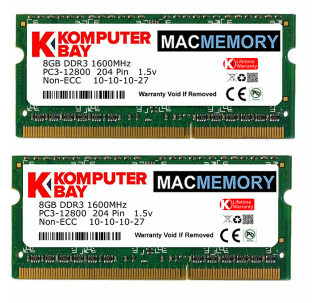 Komputerbay is little known, but we discovered this vendor for memory almost a year ago and bought special memory for a server and it has worked reliably for the entire year so far. The first set of memory we got didn't work correctly with our specific hardware, we worked with customer service and they made things right. Found out that we needed a specific type of memory, and sent us replacement memory hassle free to get us up and running. Best price I found on memory after shopping the web for weeks Review by Ricky A. Langford "langrick"